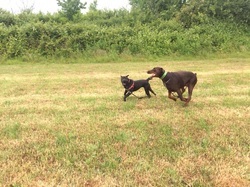 Chingford has many lovely dog walking locations, the Gunpowder Parks being some of our favourite! Apart from great parking and toilet facilities - the well planned dog-friendly paths and numerous dog poop disposal bins make it a dog walking paradise! 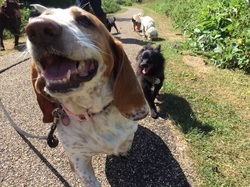 Groups of up to 5 friendly dogs per handler can enjoy our walks - with each dog carefully grouped depending on their individual needs so that each pooch gets the most out of their walk. 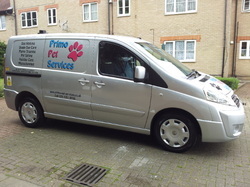 One of our DEFRA standard dog vans or our well equipped dog-safe cars will collect your dog from your home, walk them for an hour and drop them home relaxed and (as much as possible) dry! unfortunately we do not provide private walks however if your dog is nervous, elderly or simply has no manners - we can group your pooch with suitable companions to help them enjoy their walks. If your dog does not appreciate the company of others, we offer pet visits where we can simply walk your them around the block during the daytime to stretch their legs.